Denver Film Critics Society, Empire Awards UK, European Film Awards: Best Comedy; National Society of Film Critics, San Diego Film Critics Society Awards: Best Screenplay. 13 other wins, 34 nominations. “The Death of Stalin” is based on a French comic-book series depicting the aftermath of the notorious Soviet dictator’s demise. It is brilliant and hilarious, a delicious mélange of political satire and farce. The premise is straightforward: Josef Stalin dies by choking in his office one night. When his body is discovered the next morning, his closest colleagues gather and frantically jockey for power, exposing their own peccadilloes while sabotaging each other’s chances to become Russia’s supreme leader. Like director Iannucci’s “Veep” on TV, this movie depends on great writing, expert casting, as well as timing, delivery and staging that make the most of a knockout screenplay. The filmmakers assume that we don’t know anything about the history they’re depicting. Fortunately, one doesn’t have to take an entrance exam to enjoy their movie. The cast is daunting. 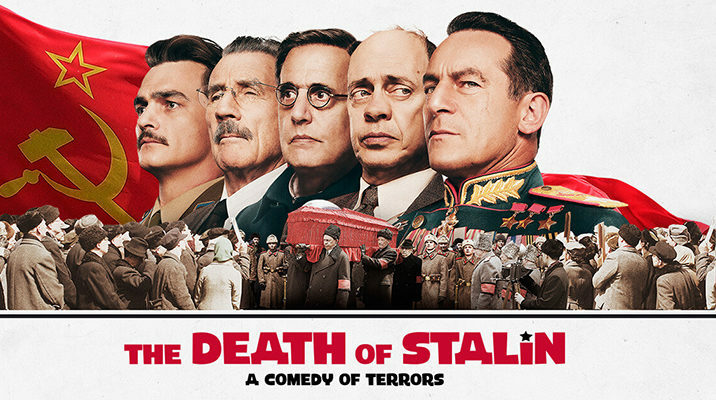 Steve Buscemi may not spring to mind to play Nikita Krushchev, but he is amusing, as is Jeffrey Tambor, Simon Russell Beale, Michael Palin, Jason Isaacs, Rupert Friend, and the other members of the ensemble. Beale, primarily a stage actor, is overwhelming in his ferocious interpretation of Levrenti Beria, the wiliest and nastiest man in the Soviet Politbureau. .
Iannucci conducts the proceedings like the conductor of a great orchestra with an array of virtuosos at his command. “The Death of Stalin” is a breath of fresh air and a genuinely great screen comedy.